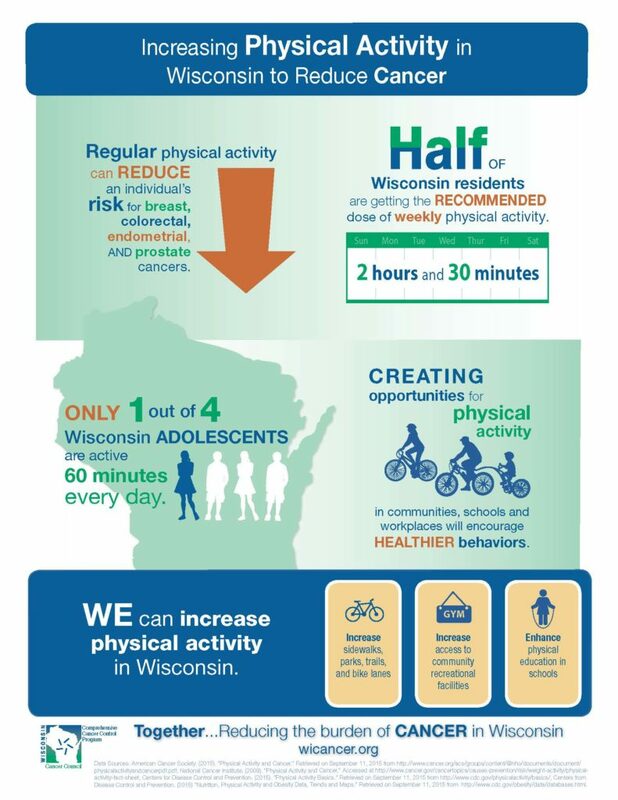 The WI Comprehensive Cancer Control Program is pleased to share the September 2015 Issue Brief, “Physical Activity's Connection to Cancer: Policy & System Opportunities to Reduce Cancer in Wisconsin.” A companion infographic, “Increasing Physical Activity in Wisconsin to Reduce Cancer,” was also developed to provide an illustrative summary of information shared in the Issue Brief. Both the Issue Brief and Infographic can be used as tools to implement action steps found in the WI Comprehensive Cancer Control Plan under Priority 2: Increase healthy, active lifestyles. Comprehensive cancer control partners and Wisconsin Cancer Council members are encouraged to use Issue Briefs and Infographics as educational tools to inform their partners on important issues related to reducing the burden of cancer in Wisconsin. The Infographic Series and Issue Brief Series can be found online at www.wicancer.org under Resources.